Teleios Systems: Hello. Hello. Hello. On Wednesday 21st February, 2018 Teleios Systems Limited opened their doors to the electrical engineering students from the University of the West Indies St. Augustine. The three hour tour presented a componential view of Teleios Systems and to then enable students to understand what it takes to build a technology company. Gillian Codrington, Manager, ODCS at Teleios Systems Ltd. speaks to students about Teleios. Manager, Organisational Development and Corporate Services, ODCS, Gillian Codrington gives an introduction to the rationale for building a company like Teleios. This examined it’s foundations, philosophy and approach to development (of people, business and products). Ikechi Griffith from MessageCentral at Teleios Systems Ltd. speaks about products created by Teleios. Ikechi Griffith of the MessageCentral team, Niall Johnson of the QuikWorx Platform team and Kneckel Bruce of the PowerWorx team featured a multifaceted approach where the students were split into 3 sets to discuss the major products created by Teleios. Ryan Shripat, Software Development Lead, Solutions and Services Group at Teleios Systems Ltd. speaks about the employees at Teleios. 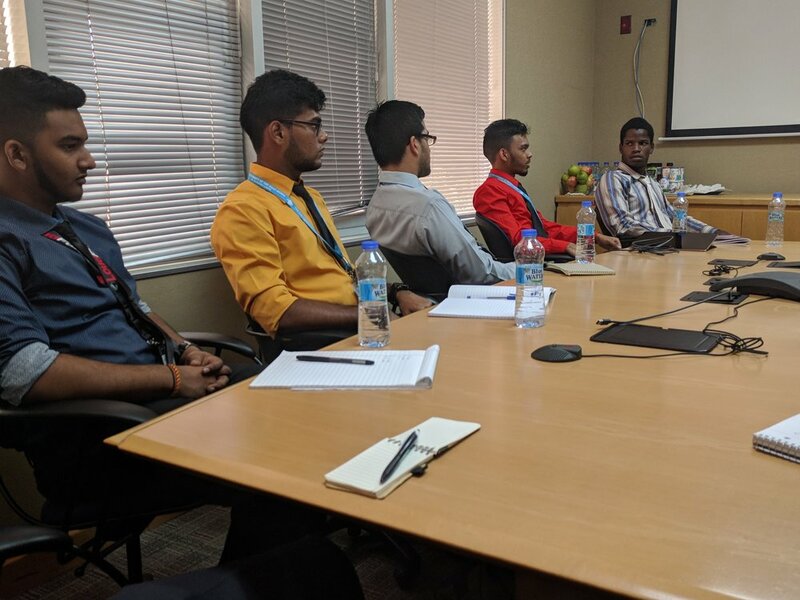 Software Development Lead, Solutions and Services Group, Ryan Shripat gave the students perspective about the kind of people working at or have worked at Teleios. Describing the characteristics of Teleios employees, the students understood the culture that made a Teleios employee. Irwin Williams, Engineering Excellence, Teleios Systems Ltd. speaks about resume writing. Irwin Williams driver of Engineering Excellence at Teleios continued to develop a practice started a few years ago. Asking students to imagine what they’d like their resume to look like by the time they graduate. A small workshop, the students were asked to actually filled out a pre-resume and then discuss pathways to get things done in their time while on campus. Keisha Mark-Peters & Akash Harriram used the overall Teleios Code Jam (TCJ) history to chronicle TCJ, the work of Team Unbeatable and encourage the students to see why participating in things like TCJ can significantly augment their growth and development. At the end, Kevin Khelawan spoke with the students to get feedback about the overall time spent learning about the Teleios world. Tyree Smith & Irwin Williams.